How to remove those stubborn dead leaves from your terrarium? 14" scissors! I am finally getting a pair of my own and hopefully my terrariums will be looking a little neater sooner than later.... I have put off pruning for too long. I purchased a pair off ebay, and then realized you can find them on plain old amazon. These totally remind me of Edward Scissorhands. :) Happy trimming! ohmygoodness! i think everyone should own a pair of these! What a useful idea, great for an aquarium too. Agreed. I can't wait to get to work! I've bought from them. They're good products, and they ship fast. If you don't want to purchase the entire set, contact them by email to ask if they ship individual pieces. 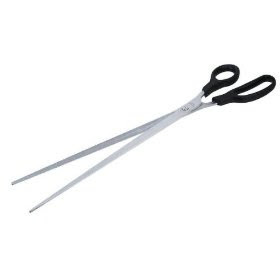 I got several nice scissors for friends at a discount. Great tips Shireen! Thanks for sharing.